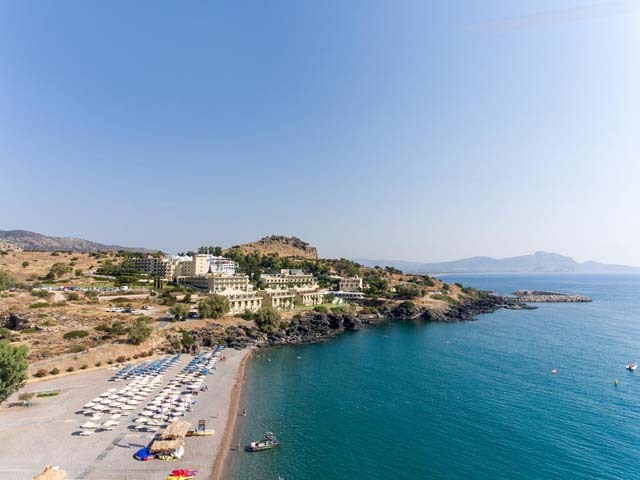 Welcome to Lindos Royal Resort, a world where all the timeless charms of Rhodes come together to create a mesmerizing holiday experience on the tranquil south-eastern coast of the island and the sublime Vlycha Bay. 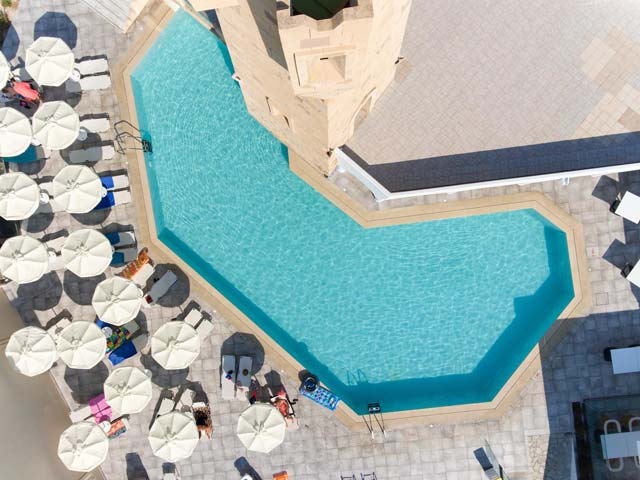 Its architecture was inspired by the rich medieval history of Rhodes and the alluring landscape of the region of Lindos where the resort is located, and all of its elements were designed as the ultimate destination for summer enjoyment. Enter a realm of fun gently tucked away in a cove surrounded by palms and bougainvillea; the 5-star Lindos Royal Resort will transform your holiday into an unforgettable holiday adventure. 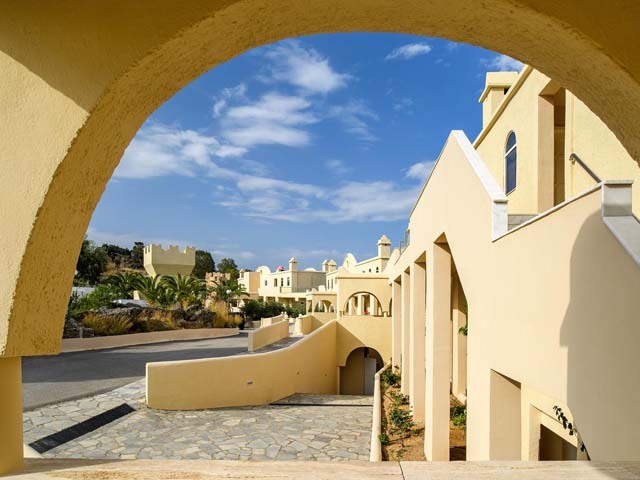 Lindos Royal Resort combines everything you could ever ask for from your holidays in the Greek Islands. 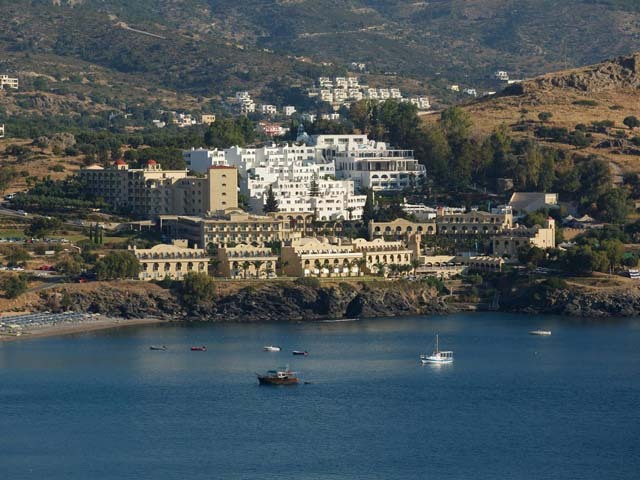 Outstanding accommodation in elegant rooms and suites overlooking the sea, culinary delights from every corner of the world, and everything you might need to enjoy the sunny summers of Lindos and Vlycha Bay. 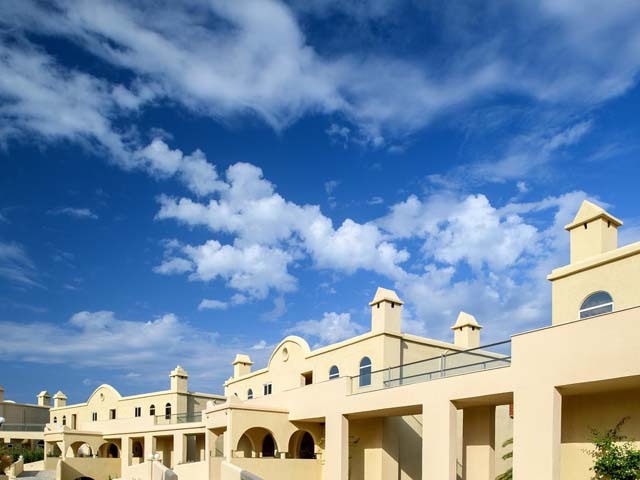 This superb resort epitomizes the joys of the summer; all you need to do is to join in on the summer fun! 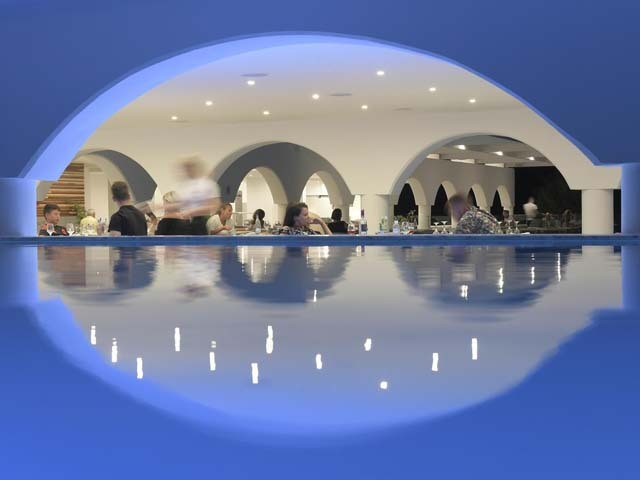 Welcome to Lindos Royal Resort on Vlycha Bay, Rhodes; welcome to the best holidays of your life! 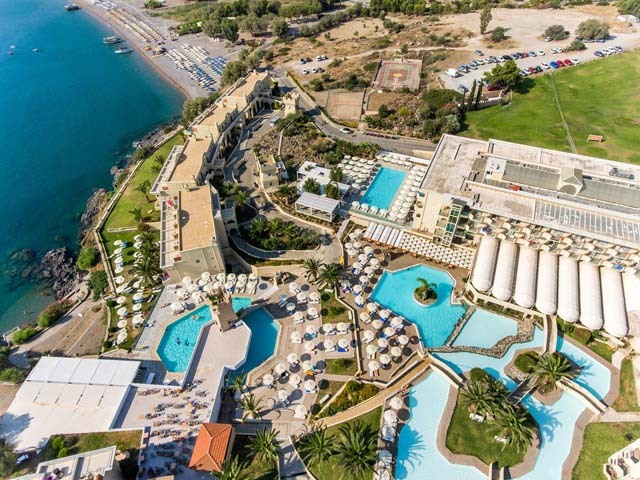 Lindos Royal Resort is located on a privileged location just above Vlycha Bay, one of the most idyllic and graceful sand and pebble beaches of Rhodes. 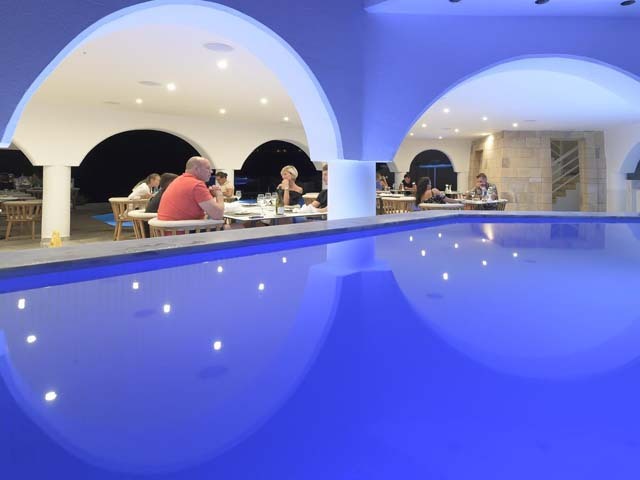 On the island’s eastern coast and conveniently close to the famous traditional village of Lindos, the resort is ideally located for tranquil holidays by the beach yet within a short drive to one of Rhodes’ most cosmopolitan spots. Vlycha Bay is a charming cove with shallow, crystal clear waters that deepen smoothly and gradually. 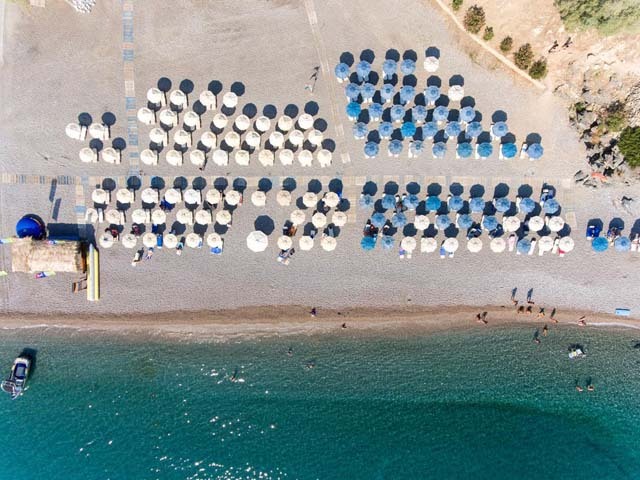 The beach itself is a mixture of sand and small pebbles, and it is fully organized, with sun-beds and umbrellas as well as several water sports facilities and snack bars. A private section of Vlycha Bay is allocated for the Lindos Royal Resort and its guests, where you will find a sun-bed for you under the shimmering sun to enjoy the blissful moments of the Greek summer. The traditional village of Lindos is one of the most popular cosmopolitan destinations on the island of Rhodes. Built on the original spot of the ancient Greek town of Lindos, right beneath its majestic Acropolis, Lindos is a conglomeration of everything that makes Rhodes Island so unique; the rich history, the colourful culture, the iconic architecture and an enchanting allure so unlike any other spot on the island. 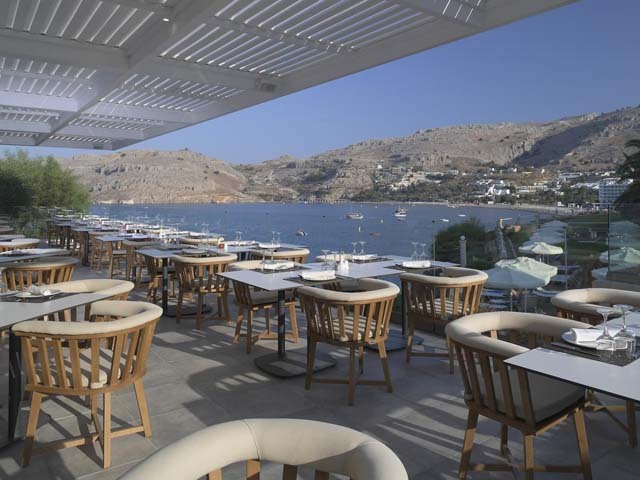 Lindos is home to numerous high-end shops, restaurants and bars, whereas it is considered a major gastronomic destination. Its beach, a small cove right beneath the Acropolis is a heavenly haven of golden sands and crystalline waters, whereas behind the Acropolis rock, the charming cove of Saint Paul is the very spot the Apostle Paul first set his foot on Europe on his quest to spread Christianity to the world. The Superior Double Room with Garden or Sea or Part Sea View of Lindos Royal is your new favourite spot of utter tranquillity and comfort. Recently renovated, with an air of modern sophistication, the Superior Double Room features a double or twin bed and a standard single sofa bed or a single bed, easily accommodating two adults and a child or up to three adults. The Room opens up to the welcoming freshness of the resort’s garden or the sea creating an enchanting allure you’ll simply fall in love with. 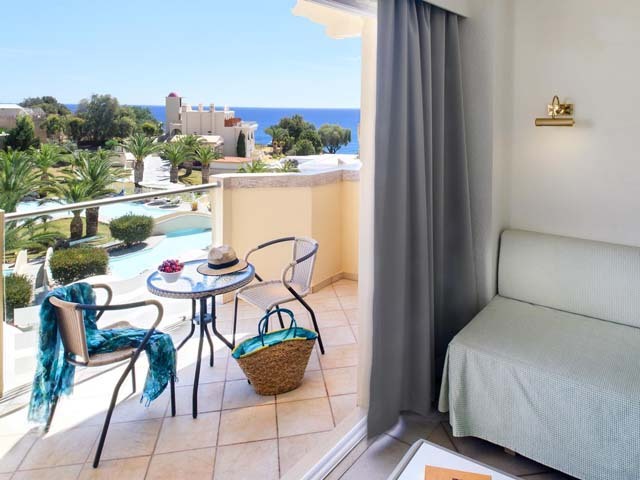 The Deluxe Double Room with Garden or Sea View of Lindos Royal Resort is an exceptional accommodation proposal for families with young children or two couples traveling together. This warm and welcoming room is decorated in dark brown and blue hues, and can easily be divided in two separate spaces for additional privacy. 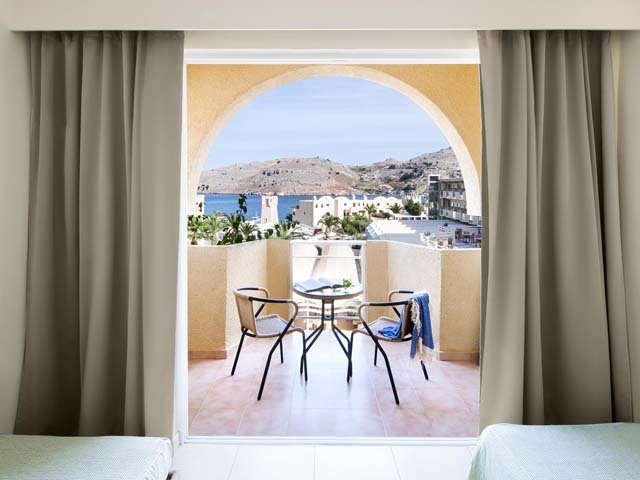 The Lindos Royal Deluxe Double Room features a standard double or twin bed and two single sofa beds separated by a sliding or folding door, as well as a balcony with soothing views to the resort’s gardens or the sea. 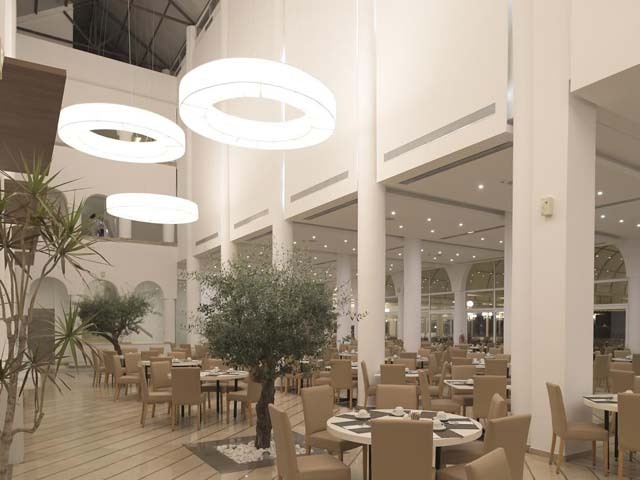 The Family Room with Garden or Sea or Part Sea View of Lindos Royal Resort is an exceptional accommodation proposal for families with young children or two couples traveling together. This warm and welcoming room is decorated in dark brown and blue hues, and can easily be divided in two separate spaces for additional privacy. The Lindos Royal Family Room features a standard double bed or twin bed and two single sofa beds separated by a sliding or folding door, as well as a balcony with gorgeous view to the sea. 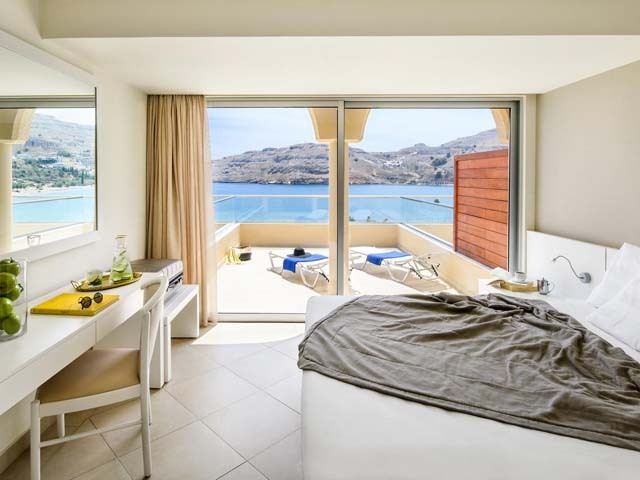 Elegant and spacious, the Junior Suites of Lindos Royal Resort redefine cosiness and sophisticated accommodation. The Junior Suite features a double bed or twin bed on the lower section of the room and two sofa beds on the second level, slightly above the first and can easily host up to 4 persons in its welcoming space. 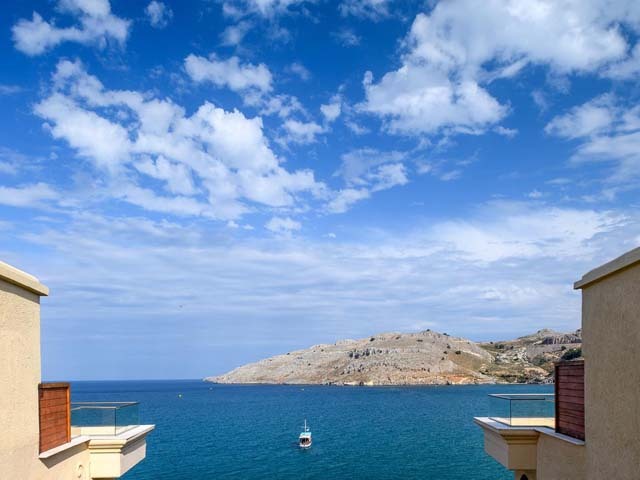 The Suite opens up to a balcony overlooking the tranquil bay of Vlycha and the sea. 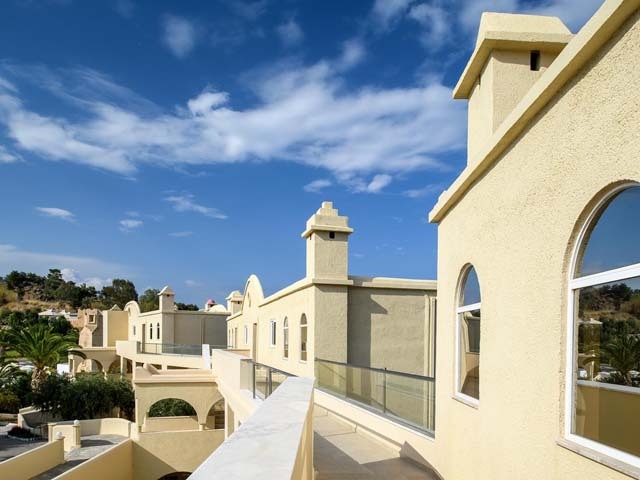 In the Suites with Sea View of Lindos Royal, modern travellers find their home away from home in Vlycha Bay, Rhodes. The Suite consists of two rooms and a seating area, all recently renovated in soft earthy tones, and it can easily accommodate up to 4 persons in its welcoming space. The Suite opens out to a balcony overlooking the azure expanse of the sea, whereas, for additional convenience, Suites with two bathrooms are also available. An indulging Spa meant to pamper all your senses! 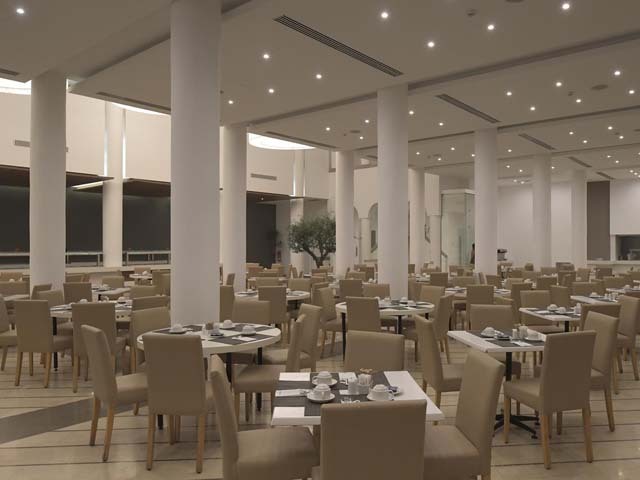 Lindos Village Resort & Spa, sister-hotel of Lindos Royal features the lavish Evridiki Spa Centre, and the guests of Lindos Royal Resort are welcome to use it (reservation required). Step in, take a deep breath and let the calming sound of relaxation slowly refresh your mind. In a balanced environment, designed with attention to detail and inspired by the soothing beauty of the Aegean Sea, Evridiki Spa offers soothing, rejuvenating and revitalizing treatments for your skin, your body and face that will make you feel brand new! Here, you can leave all else behind and focus on what is truly important, your body’s and your mind’s wellness. Let yourself in the capable hands of our experienced, certified therapists and treat your face, your body and your mind with exquisite treatments devoted to achieving total harmony between your body and soul. Start with an invigorating Sauna session, or a restful Jacuzzi bath; continue with a soothing massage and a lush treatment; pamper your skin with a lavish therapy or soothe your feet with an indulging Apivita foot ritual; your body is your temple and you ought to offer it the most pampering gifts! The journey into inner balance and beauty does not end there, of course. Our hair, nail and make-up professionals can add their finishing touches to your overall look for stylish outings and the fulfilling sensation of beauty all day long, inside and out! For wedding parties and other events, it is advisable to book your appointments in advance. Evridiki Spa of the Lindos Village Resort is your new, favourite corner of self-care, a place where nothing else matters but you! 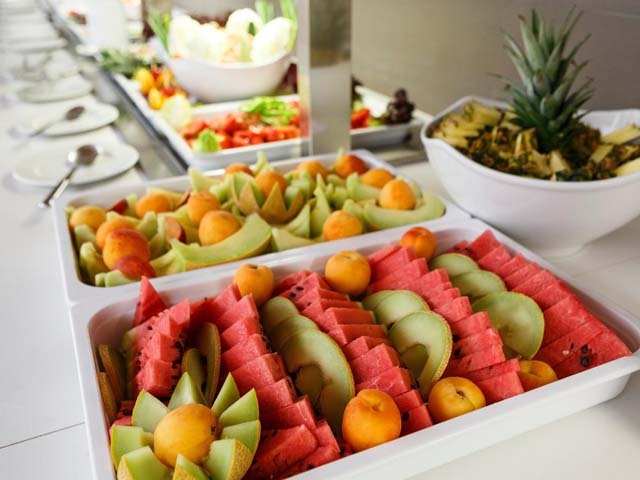 Some might find it hard to keep up with their fitness regimes when on holiday abroad; but that’s just because they haven’t found the right hotel yet! In Lindos Royal Resort, on Vlycha Beach, Rhodes exercising is as easy and simple as it could ever be! Let the refreshing climate of the south-eastern part of Rhodes inspire you and push you to exert your limits and try out new, fun forms of athletic exercise. Enjoy some of the most classic outdoor sports in our sports activity area which features tennis courts or combine Lindos Royal’s superb seaside location with exhilarating group sports such as football. A variety of water-sports is available at the beach (extra charges apply – provider not affiliated with Lindos Royal Resort). 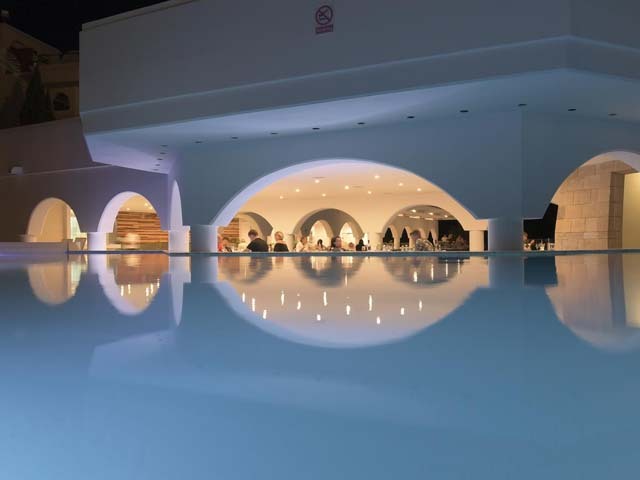 But even if you are not a huge fan of working out, there is certainly something in Lindos Royal Resort for you too. 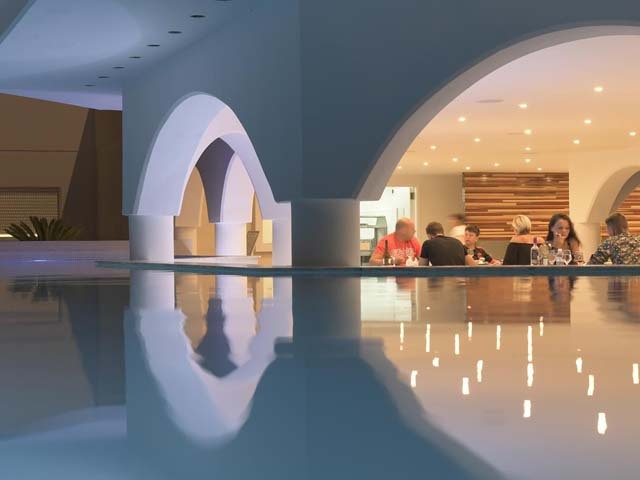 Start from our three expansive swimming pools for refreshing dips and our aqua slides for an added touch of excitement, and continue to the game room for your evening entertainment. As for our young friends, Lindos Royal Resort features a mini-club (ages 6-12) and lots of animation teams and activities throughout the day! 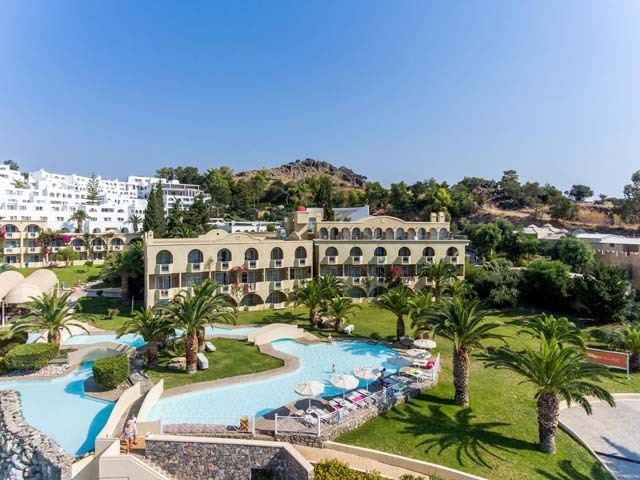 Our sister hotel Lindos Village Resort & Spa, located conveniently close to Lindos Royal features a fully equipped fitness room and offers daily exercise group sessions, personal trainers and more. If you wish to participate, please address the Lindos Royal Concierge for all the details. 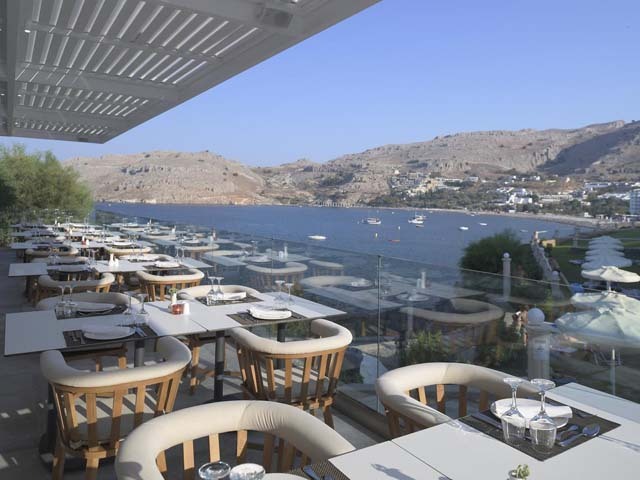 Meet the gastronomic spots that will make all the difference to your Rhodes Island holiday; the restaurants of Lindos Royal Resort will treat your palate with delicious tastes from early morning till after the sun goes down. 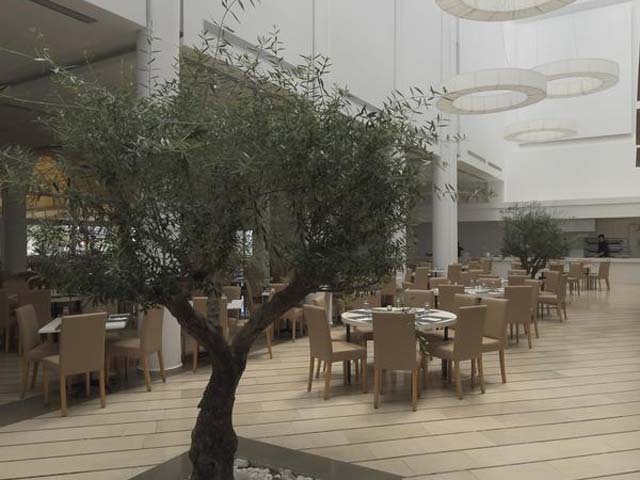 Utmost care is given so that all our dishes are prepared with fresh, local ingredients and respect to the rich culinary culture of Rhodes and Greece. 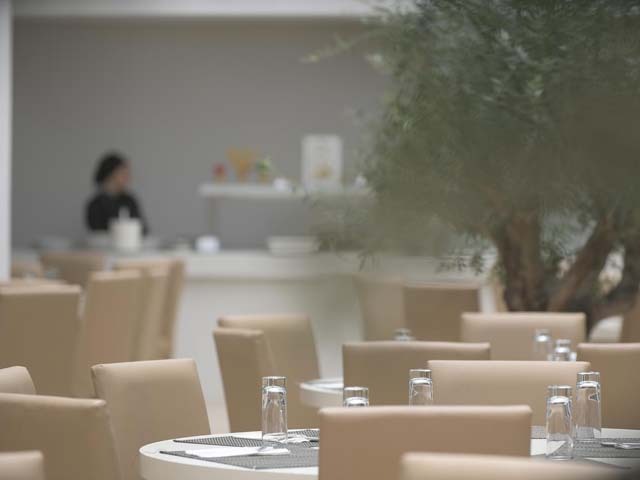 Our hope is that we have designed our menus with your complete gratification in mind, with traditional Greek tastes, combined with international classics and signature Mediterranean recipes that everyone will love, and always prepared with passion and love. 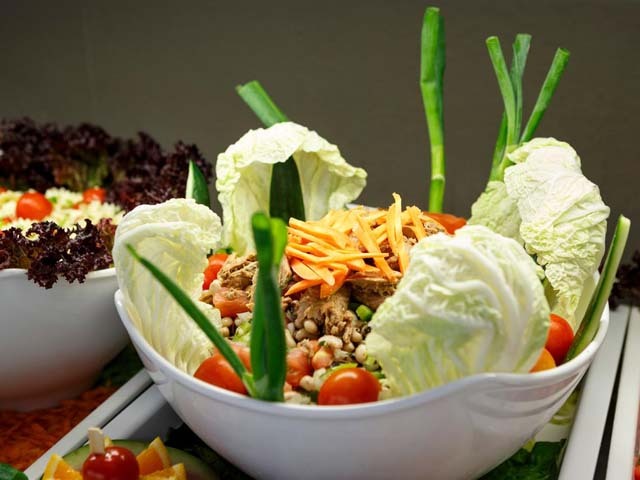 Join us to taste the flavours that will complement your holidays in the most delicious way! The Above Special Discounted rates are incluisve all local taxes, services on All Incluisve basis. Rooms marked (b) Rates are not valid for DE,CZH, Poland,Slovakia & Italian Markets !! 14 Days prior arrival - no cancellation fee. 7 - 1 Days or non show -100% cancellation fee. SUPER Offer Save Up To 45% !!!!! 01.10.18 - 28.10.18 !! Special Offer Save Up To 45 % !!!!! The offer is valid for the stay: 01.10.18 - 28.10.18 !!!!! BOOK NOW !!!!! LIMITED TIME OFFER !!!!! Special Offer and Save Up To 35% !!!!! The offer is valid for the stay: 01.05.19 - 24.05.19 !!!!! BOOK NOW !!!!! LIMITED TIME OFFER !!!!! Book Early for 2019 and save up to 30% off !!! The offer is valid till 30/04/19 !! Free Cancellation !! Book NOW for 2019 and save up to 30% off !!! The offer is valid for Bookings received before 30,04,19 !! !! Free Cancellation !! LIMITED NUMBER OF ROOMS ! !